Choosing a location to keep honey bees is not difficult, but it must be well planned. 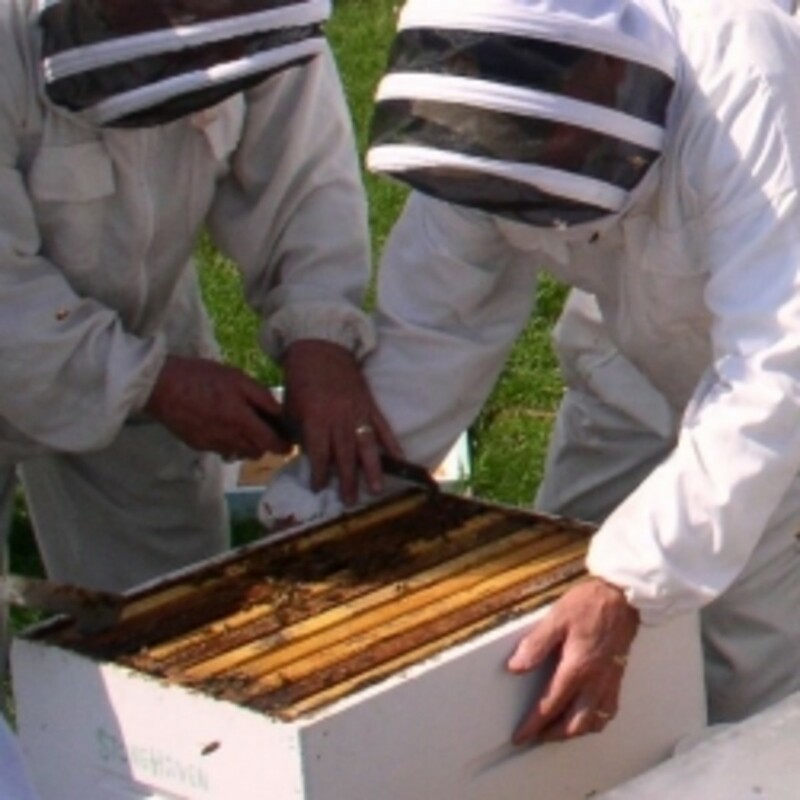 It is important to realize the needs of the bees and the beekeeper prior to hive placement. A poorly placed hive can cause unhealthy bees or attract unwanted attention. The beekeeper needs room to work the hive and conduct regular beekeeping tasks. The bees need protection from both the elements and predators. Not to mention things like parking a vehicle or storing tools and supplies. Hive location is more than sitting a white box on concrete blocks. A new beehive location is a new apiary, no matter how many hives it holds. Hives in our Caney Creek Honey bee yard, near Carrollton, Georgia. The beekeeper is the one running the show, so let's consider their needs first. Even if there is only one hive to place, try to choose a location that could hold more if necessary. 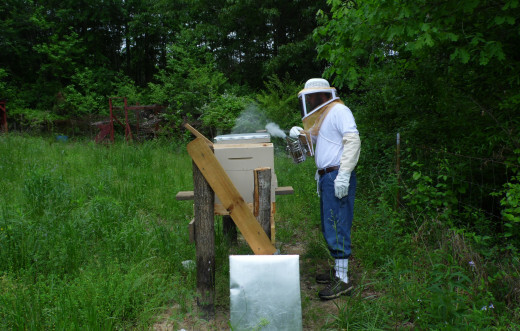 Several beekeeping scenarios would require the use of more hives at some point. Also, beekeeping can easily become an obsession, which will definitely require more beehives. The new apiary site should also include space to store beekeeping tools and extra equipment. This doesn't have to mean a shed or outbuilding space, simple solutions sometimes work best. An extra hive with tools stored inside can provide both. Tools like a smoker and hive tool are stored inside the hive and the hive is the extra equipment. This is a great setup, especially for temporary or small bee yards. Just set up a hive with whatever size hive bodies you use, just like you would for bees. Instead of filling it with frames, place your tools inside. Make sure and close up the entrance so that no other insects or animals make your tool hive their new home. Access to the site is also important to consider. If it is a bee yard that requires a commute, then a driveway and parking area are a must. The best option is to be able to park your vehicle very close to the apiary. When supers fill up with honey, they get mighty heavy. 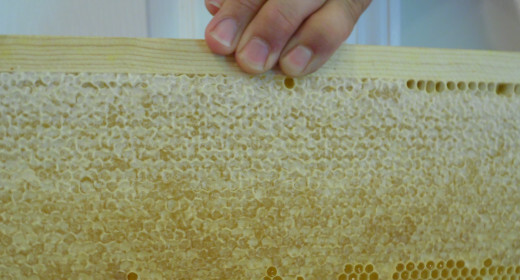 The needs of the honey bees are simple, but necessary for a healthy colony. First and foremost, the bees need protection from predators. While there are many predators that pose a danger to a honey bee hive, the two most destructive are bears and humans. If the apiary is located in an area with bears, then proper fencing should be in place before the hives are set up. An electric fence seems to the best option for keeping bears at bay. Electric fence mesh is gaining popularity, and it seems to work better when the ground is snow covered. Electric fence mesh is usually sold as a portable livestock fence. There are different fence chargers available, including battery and solar powered options. Humans often present the greatest threat to honey bee hives. Some people are afraid of honey bees, and may try to harm the bees. Those that know the value of a strong colony may steal the bees. But the majority of human problems will arise from curious folks getting too close and getting stung. There is just something about a busy beehive that makes some people want to throw rocks at it. The best way to protect an apiary from human predators is to limit visibility. An apiary that can't be seen by neighbors or passing traffic is often pretty safe from human interference. Even an apiary located in a crowded neighborhood is better off hidden behind a privacy fence. Another advantage of privacy fence is that it forces the bees to fly higher when leaving and returning to the hive. This high flying action normally keeps them up out of the way of nearby humans. Honey bees will also appreciate a little protection from the elements. 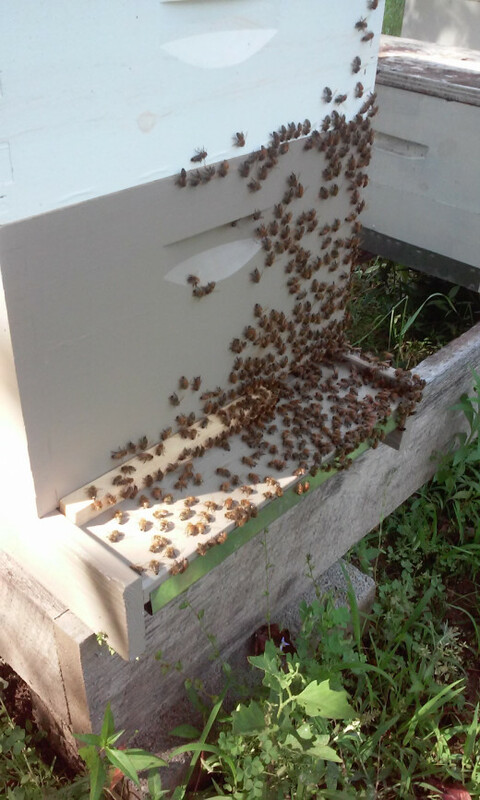 While a healthy hive can tolerate pretty extreme weather, it is always safer to help out a little. After all, hives are meant to thrive, not just survive. In most cases trees and shrubs can provide all the protection a hive should need. Whenever possible, try to place hives where they will be protected from strong winds by surrounding vegetation. If there is no surrounding vegetation, a shrub row creates a great wind block. When planting a shrub row, keep in mind the direction of winter winds and storms. Chinese Holly makes a great tall shrub row and honey bees love the blooms. Planting fruit trees is an obvious choice to help provide shade for both bees and a hot beekeeper. When providing shade from trees, it is better to have afternoon shade. Don't choose a location that stays shaded all day long. Honey bees need at least some sunshine daily. A little sunshine will go a long way towards keeping your honey bee colonies healthy. Frame full of honey bees with the queen strolling around. 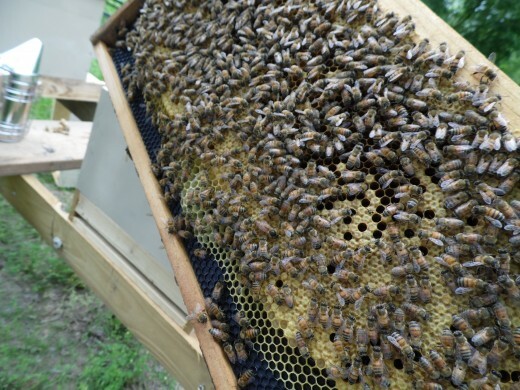 Do you plan to set up an apiary in the upcoming year? Maybe, still thinking about it. No, just interested in honey bees. A well established honey bee colony requires a lot of work to relocate. 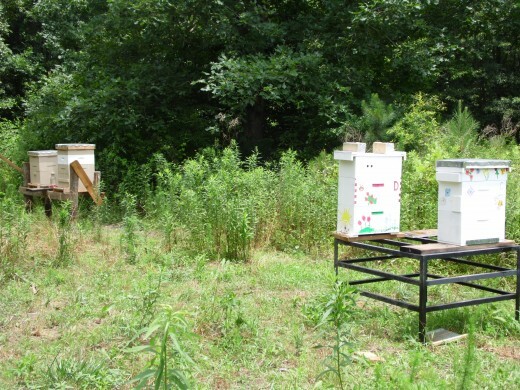 Don't settle for an apiary site that can't meet the requirements of both bees and beekeeper. 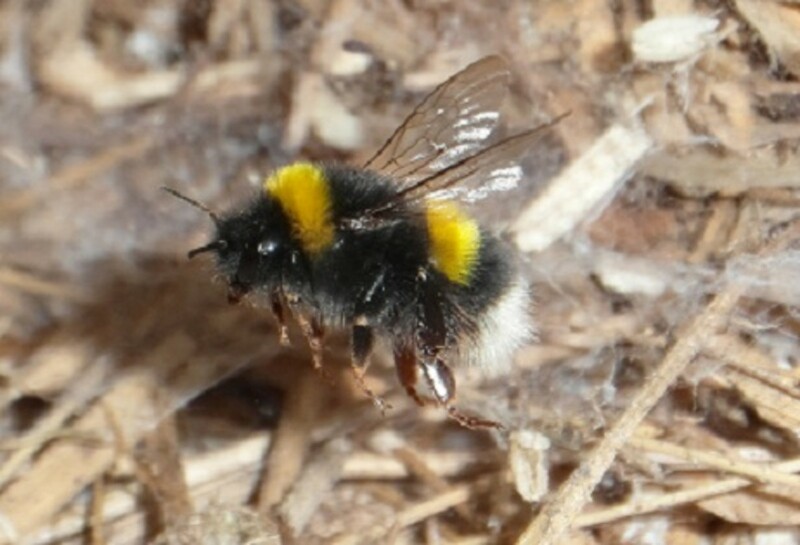 A poorly chosen bee yard site will often result in having to move hives elsewhere. Of course, if the site choice is limited, just make use of the available area. A perfect site is going to be impossible to find, but any site can usually be improved. Consider the needs of both the beekeeper and the honey bees. A location that can satisfy both should make a great new apiary. I hope you have good luck with your rabbits, quail, and bees. I kept rabbits for several years and always enjoyed them. They provide tons of great fertilizer. This will be my project for next spring. Thanks for the information. I'm busy building rabbit hutches and quail enclosures right now, but next spring I'll use your info and move forward on the bees. Thanks for the support Imtii, I really enjoyed writing this article. Beekeeping is a favorite hobby of mine. That sounds very interesting. I have seen a few videos of people collecting wild honey. Thanks for your comments. Nice hub mgeorge1050. I like the way you did it. In country which Bangladesh people don't really make Bee hive. They collect the honey from the Shundarbans. Which is a great source of honey and bee. Thanks for taking a look DDE, I always look forward to your wonderful comments. Thanks Sheila, you always have something nice to say. I think a lot of new beekeepers don't think about some of the things I mentioned. A well established beehive can weigh hundreds of pounds, so it is much easier to pick a good site than to have to move hives later. I don't plan on starting an apiary, but I found your hub interesting. I didn't know there were so many things to consider when choosing a location. My sis-in-law's dad had honey bees and I always thought he chose the place because it was far enough away from the house. Now I know otherwise. He was a smart guy and probably picked the place for all the reasons you mentioned.